Despite tireless efforts from the CTU and school communities across Chicago, the mayor’s handpicked Board of Education voted on Wednesday to close three schools and consolidate others. While we will continue to oppose the Board’s deplorable decision, it’s worth remembering that we succeeded in derailing CPS plans to co-locate a charter in Hirsch H.S. next year, and forced CPS to retreat on outright closing three of Englewood’s high schools. That fight by our union and our allies means that 45 of our members will have secure work next year. 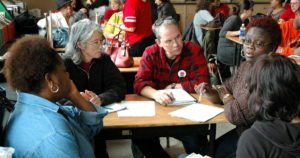 We can also report that, at the CTU’s insistence, CPS has agreed to work to secure full-time positions for the coming school year for members impacted by outright closure, including teachers at Robeson H.S. We will also continue to defend all impacted members’ rights under Appendix H of our contract and in our organizing and political work on the ground. We have made some changes in staffing in our contract enforcement department due to retirement and restructuring, so please look up your field rep at www.ctunet.com/reps and get in touch with them should you have any questions. We will continue to battle this unelected school board and the mayor who controls its agenda of ignoring the wishes of the students and families of this city who cherish their neighborhood public schools as centers of learning and incubators of creativity and hope. That’s why we’re asking you to contact your state senator and demand what every other school district in the state has: an elected, representative school board that provides our city with the democratic control and accountability we deserve. Please spread the word about this effort. The Illinois House has overwhelmingly voted to give Chicagoans this right. Now we need to push the Senate to do the same, and finally put an end to this mayor’s pitiless and failed school policies. The Board of Ed, top school bureaucrats and the mayor who dictates their actions ignore parents, students, community residents and our members at their peril. We will continue to fight school privatization, school closings and so-called phase-outs on the ground as partners in this city’s growing grassroots movement for educational equity, which is evolving into one of the great civil rights battles of our time.